THE economic and welfare benefits of best-practise HGP implant procedure were highlighted in an important award presented during the BeefEx feedlot industry conference on the Gold Coast last week. Coopers Animal Health in 2014 introduced its Revalor Top Gun program, designed to acknowledge feedlot induction crews for excellence in HGP implant performance. Persistently wet and boggy conditions through much of 2016 made for less than ideal conditions for results in such a competition, but the 20 or so yards involved in the assessment this year continued to perform up to a high level. 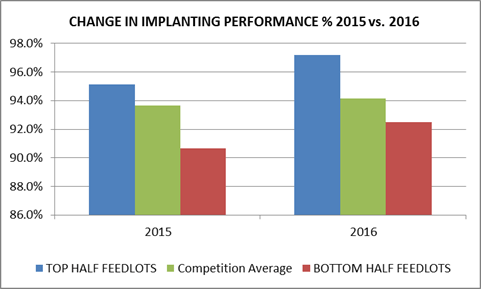 The average implant retention rate across all entries this year actually improved on 2015, to around 94 percent. By the narrowest of margins – just a single beast across the entire year – this year’s overall winner was Andrew and Tess Herbert’s 6000-head Gundamain feedlot near Eugowra in NSW. Gundamain was audited for a 98.7 percent success rate in implant retention for the year. In a classic demonstration of responding to feedback, Gundamain finished a distant thirteenth in rankings in last year’s competition, but took on-board the feedback provided in order to fine-tune its implant performance. After reviewing their implant processes last year, the induction team organised a training session with Coopers, and the results were in clear evidence in this year’s Top Gun outcome. The Gundamain result was particularly noteworthy given the types and condition of cattle being inducted this past year – often wet and dirty Angus cattle, more susceptible to implant performance problems than shorter-coated Brahman cattle in drier conditions in a typical Queensland yard. In accepting the award, Gundamain’s Andrew Herbert acknowledged the impact that HGP implant performance could have as a profit driver. “A one percent improvement in implant retention in a feedlot of our size equates to around $15,000 a year improvement,” Mr Herbert said. Gundamain’s improvement since last year was a massive 5.7pc, climbing from 93pc retention rate in 2015 to this year’s 98.7pc. 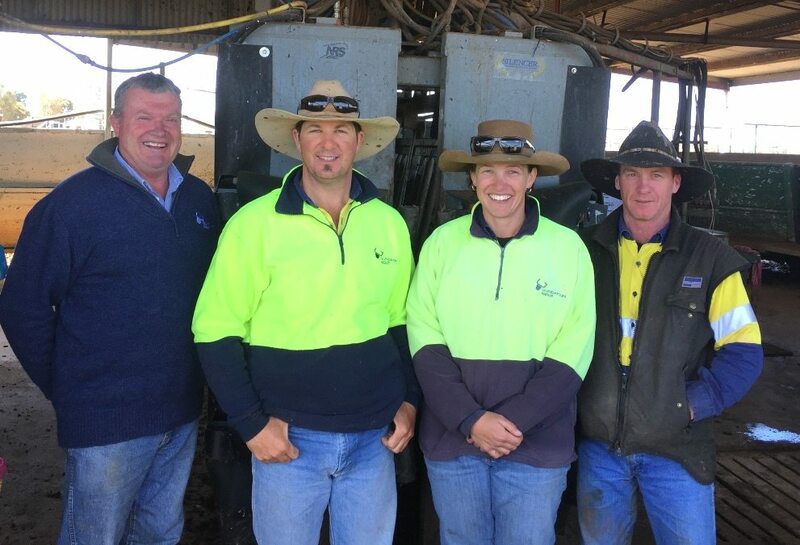 Andrew Herbert, left, with Gundamain’s feedlot induction team – Clinton Stapleton, Carlie Venables and Scott Findley. 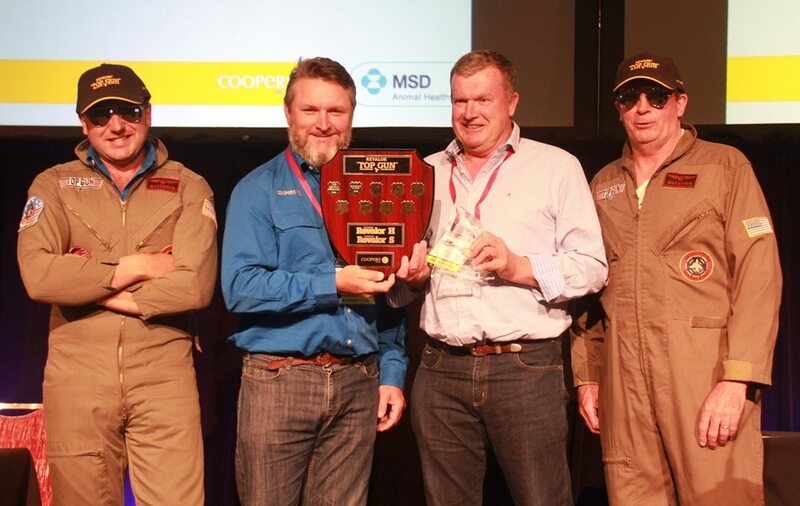 Runner-up in this year’s competition was JBS Mungindi, scoring a retention rate of 98.6 percent – just 0.1pc behind the winner – with last year’s overall champion, Teys Condamine, third on 98.1 percent. While all yards entered in the competition performed well, given the weather conditions they had to deal with, it was the significant improvement in retention rates in yards that last year featured in the bottom half of the results which was the standout feature, as this graph of results illustrates. That suggests that best-practise messages in implant practise are clearly getting through where they are needed. Once again the yards at the top of the standings were separated by only by fractions of a percent. The Top Gun competition audits HGP implant performance and importantly, offers feedlots an industry benchmark to compare their own performance against, while rewarding those induction teams that delivery consistent and industry-leading results over a 12-month cycle. The yards involved this year, of various sizes across Australia, represented a one-time feeding capacity of around 250,000 head. Competitors were audited up to eight times for HGP performance between October last year and September just passed. Scores were based on implant retention, any evidence of abscesses, hygiene practises and implant technique. The feedlot with the highest percentage of ‘good’ implants over 12 months was declared the winner. “The award is designed to reward and acknowledge feedlot induction staff – people who work hard and are not often recognised for the work they do,” Coopers national account manager Rob Baines said. “Feedlot performance is directly affected by their quality of workmanship and attention to detail. HGP implant performance can be a major profit driver in the feedlot sector, and the Top Gun program aims to monitor, help improve, and reward those people who most impact on a yard’s implant performance,” he said. Gundamain now gets to proudly hang the Coopers Top Gun perpetual shield in the feedlot office for the next 12 months, and the feedlot induction team receives individual prizes from Coopers/MSD Animal Health.